The underlying geology of Wick Golden Valley LNR and its surroundings accounts for many of the features you see around the reserve, including the quarry and the uncommon species of plants. This section explains the geology of the site, spanning timescales from millions of years ago to the present day. The Geology of the Wick Rocks Valley - An article from 1890 provides more detail and a historical perspective. 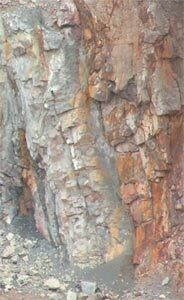 Geological Glossary - An explanation of geological terms mentioned in this section.